Healthcare has become one of the most polarizing topics in the United States. Fewer and fewer people are finding value in America’s medical system, as growing distrust continues to mount. 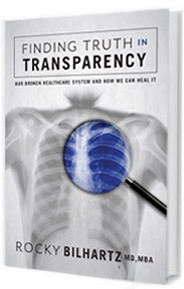 Finding Truth in Transparency: Our Broken Healthcare System and How We Can Heal It is a riveting uncensored look into the healthcare problems our country is facing and the individuals best equipped to solve them. Written by a practicing physician, Finding Truth in Transparency boldly gives you a view behind the “Iron Curtain” of medicine and you will be be shocked by what you find there. Dr. Bilhartz conveys an unprecedented understanding of why physicians are getting out of medicine, why healthcare quality measures are failing us, why your medical bills are too high, and why your insurance plan is too confusing. If you’ve ever cared to understand our current healthcare crisis and the solutions for solving it, you will not want to put this book down.